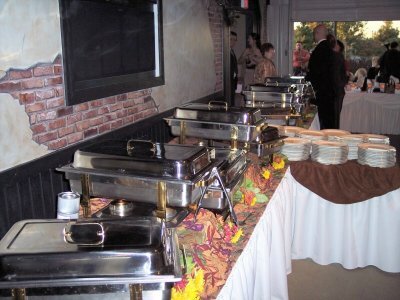 Buffet Dinner Full Service menus, Cutting Edge Catering, Catering to your every Whim! Serving Joilet and the entire Chicagoland area! Family Style: Served Directly to Each Table in Bowls & Platters. Replenished at Your Request. Buffet Style: Elegantly Presented with Colored Overlays, Props & Elevations with Fresh Floral Accents. Beefsteak Tomato Slices with Buffalo Mozzarella, Fresh Basil & Virgin Olive Oil on a Bed of Spring Mix Salad. Served with Balsamic Vinaigrette. Soup may be an option depending upon the location and kitchen capabilities. Kids, Vegetarian or Dietary Needs are Available Upon Request. The New Trend - Action Stations. Classy, Interactive & Fun! Salad Bar Station Light, Crisp & Refreshing! Pasta Station Guests will love creating their own pasta dish! that your guest will enjoy and be talking about for months and even years later. Optional - Martini Glass Rental - Call for prices & availability. These Menus will help any tight Budget. The Full Service Package described on page 3 does not apply. Our friendly staff can be available to serve & replenish your buffet along with clearing guest tables after the serve. Service Package pricing may vary depending upon the complexity of the event site for labor & equipment.